On my way back from Georgia, P and I stopped in Pennsylvania to meet up with his brother. U went home to Nepal during the winter and brought back lots of goodies. My gift was a packet of potes. Potes (pronounced kinda like po-thays), are colorful glass beaded necklaces of various colors and lengths that women wear as one of the symbols of marriage, kind of like a wedding ring or red sindoor in the part of your hair. Don’t worry P and I didn’t sneak away and get married when you weren’t looking, but even though I’m not married, I think potes are really beautiful and elegant, and I like to wear them occasionally when dressing nice for work or a party. Some of the Nepalis tease me about wearing one, “oh are you married now?” but I don’t mind. I feel it is okay to wear them occasionally since the first two potes I owned were given to me by P’s aunt. Plus, none of the necklaces I own have the golden tillery pendant which truly signifies a marriage pote. Pote shop in Nepal... with various strands of colored beads ready to be paired and twisted together to make a pote. Some potes are solid colors, some have strings of various colors. As noted, potes can come in many thicknesses and lengths. The ones I like to wear to the office are quite short, and more traditional “necklace” length, but wedding potes can be very long. During wedding ceremonies the groom generally gives the bride a long green wedding pote which is so large it is worn like a sash over one shoulder and hangs all the way down to the bride’s hip. In addition to this long green pote, some brides receive red, yellow or golden colored potes as well. 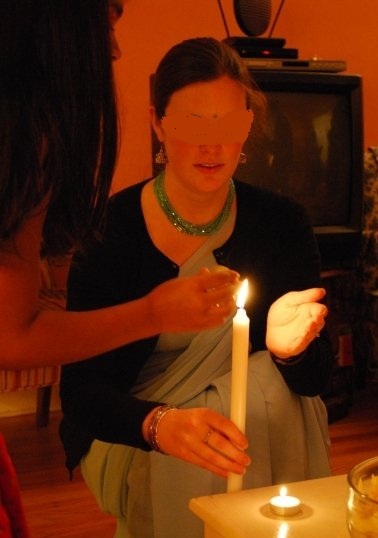 Different castes and ethnic groups have different traditions surrounding the wearing of a pote. For some a women not wearing a pote is bad luck, foreboding of her husband’s early death—and thus these women will wear it all the time, even at night. For others it is more of a fashion statement like sparkly bindis and tikkas. You don’t often find women wearing their long green wedding pote out and around town, although sometimes women may wear this symbol of marriage on a holiday like Teej. Once I get married, I’m sure the pote will have a lot more significance for me, but for now, I just think they are fun to wear. 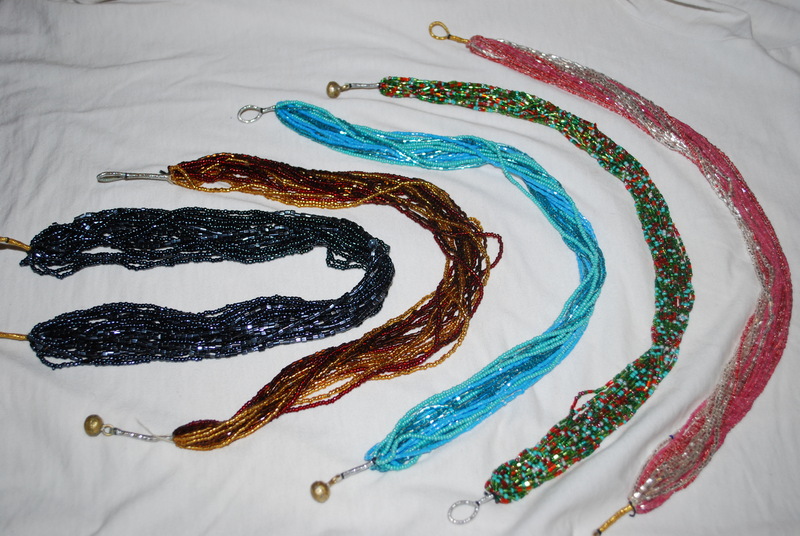 Not to mention short potes in Nepal cost about 100 Nepali Rupees (about $1.30 US), but if you buy pote style necklaces in stores in the US they cost $20-$50. This entry was posted in Society and Culture, Weddings, Women's Issues and tagged Nepali Culture, Pote, Weddings. Bookmark the permalink. Hi C…Thanks for the great info about pote. Very interesting and helpful. I am trying to find out more about tillery (or tilhari) pendants. Are these the golden beads that the pote are threaded through? Is the pendant one bead? I’ve heard a reference somewhere that the tillery is really 7 beads. I also wondered if the tillery are metal or glass. I would very much appreciate any clarification that you can provide. One more question…what is the significance of the seven bumps (originally seven beads)? Why not 5 or 9? Thank you so much for your response. I have a much better understanding of how the tilhari is constructed. to be honest, I’m not sure, however if I was to take a guess… since in a Hindu wedding ceremony you are marrying your spouse for 7 lifetimes not just one (meaning in subsequent reincarnations you will also marry), maybe the seven bumps symbolizes this? Seems like a reasonable explanation. Very interesting! Thank you so much for all of the help.